Join us for an exclusive language training session with HR and L&D professionals from all over the world. Practice your Business English skills and learn more about Talent Development at the same time. Learn the specific terms and buzz words that will help you interact with your international peers every day. The Speexx Power Up webinar series helps you get exactly the Business English language skills you need to perform in typical Recruitment areas, such as digital transformation, engagement, performance management or talent development. Master key vocabulary in an entertaining, yet effective way for social and formal situations. Brush up your English in an exclusive webinar all about Talent Development in just 45 minutes. And it is absolutely free, no obligations. Meet professionals from all over the world and let our star trainers guide you in interesting conversations on digital HR and L&D issues. You will not even notice that you’re learning English! Groups are limited to 15 seats. Work and communicate across borders with more confidence, conduct job interviews, write mails and letters, meet and negotiate in Business English. Win a free online language course! All webinar participants will be in with the chance to win an exclusive 6-month Speexx Live course. Sign up now, seats are going fast! Just enter your name and mail address. More than 8 million users in 1,500 organizations – including Saint-Gobain, UNHCR and Credit Suisse – use Speexx to learn a language smarter and deliver results on time. 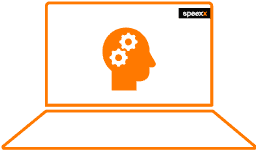 Speexx is easy to use and scales to the needs of users and training managers in organizations of any size. The Speexx branded Perfect Blend integrates online business communication skills training, mobile and social learning, expert coaches located throughout the world and personalized live online activities into one fully standardized, globally consistent learning experience.